Google Trends is my friend. 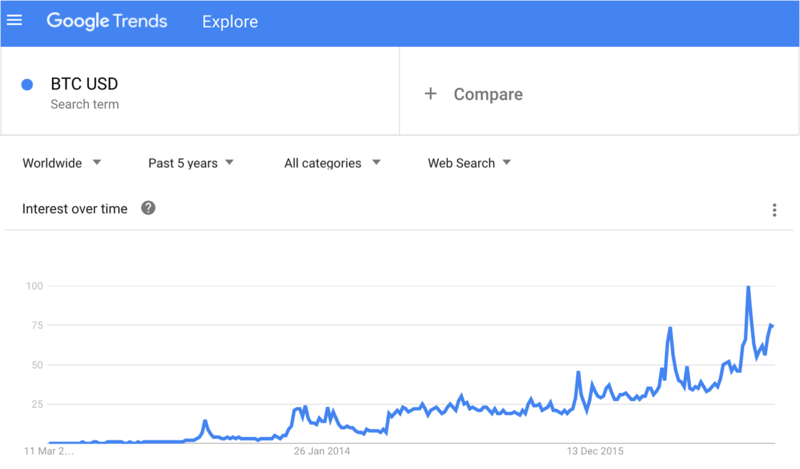 It’s a great tool for reporting search trends over time, and I’ve seen many people publish Trend’s charts of the search term “Buy Bitcoin”, to track Bitcoin’s interest by the public over time. I thought I’d use this tool to investigate the growth of active users of Bitcoin. For this I used the search term “BTC USD”. If you’re an active Bitcoin user, it’s likely you’ll be checking the price periodically. A proportion of users just type “BTC USD” into Google to get the reported price, thus we can use it as a proxy to the growth and engagement of active Bitcoin users over time. What we have here is a steady exponential growth baseline with periodic peaks. These peaks are are inline with price bubbles where more users start checking the price of their precious coins. Taking readings from the baseline results in an order of magnitude growth every 3.375 years. Or expressed in terms of time to double the user base it’s approximately 12 months. In honour of Gordon Moore’s approach to doubling of transistors, I shall call this the Woo’s Law of Bitcoin user growth LOL. ** 371 days to be exact, but let’s give or take a few weeks to account for errors. There’s expected to be 10 billion people on this planet. If we take 10 million as the active user count of Bitcoin today, there’s 1000x of growth to go. That would take 10 years to get 100%. 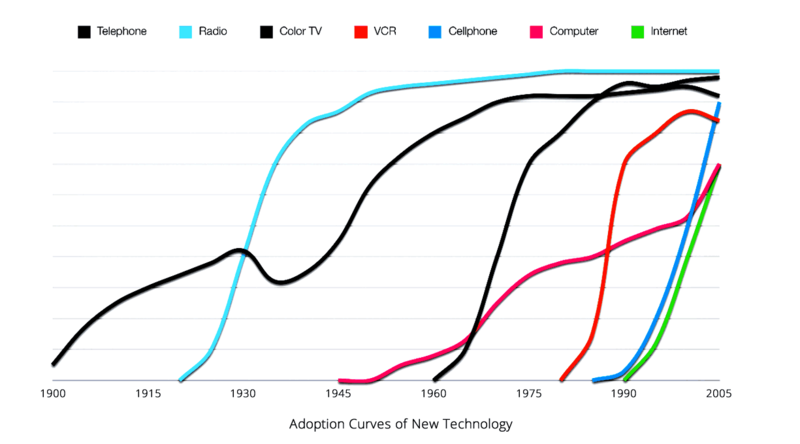 But in the real world all adoption curves follow an S.
If I was to assume Bitcoin’s adoption curve will be a symmetric S-curve, we’ll reach 50% adoption in 9 more years, however to complete the last half of the S will take 17 more years – 26 years from today. This is roughly one human generation from today. Children today by the time they reach adulthood, will transact in a world where everyone uses Bitcoin.